Learn How These Clear Braces in Norwood Can Shift Your Teeth! 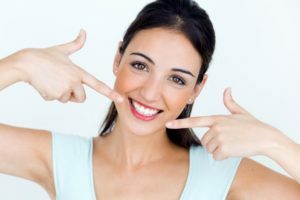 It’s not surprising that many people want to have a straighter smile. Not only do they believe it will make their smile more attractive, but it will also improve their bite and make basic tasks like brushing and flossing easier! However, when they learn about the length of treatment time as well as the necessary changes to their appearance and habits they need to make to accommodate metal braces, they give up immediately. With Inman clear braces in Norwood, they don’t have to give up any longer. The Inman aligner looks very similar to a retainer and consists of nickel titanium springs and plastic bows that work to shift teeth over time. The coil springs power the aligner bows, which oppose each other and guide teeth into a new position. As the inner bow pushes the back of teeth outward, the outer bow pushes the same teeth inward. Unlike other clear braces, the Inman Aligner only consists of one piece, making it easy to keep track of and carry with you throughout the day. It can also be used on its own or prior to another restorative or aesthetic treatment to make it smoother. Regardless of how you use it, it can help dentists certified in its use perform predictable rotations, protrusions and retroclination, all without elastics or arch wires typically found in traditional orthodontic devices. How Long is Treatment With Inman? The Inman Aligner is typically for patients with mild to moderate misalignment issues and takes anywhere from six to 18 weeks to complete. However, this time frame can vary depending on the complexity of the case being treated. When comparing that treatment time to metal braces (18 to 36 months) and even other clear braces (6 to 18 months), it’s quite surprising for people to hear! Keep in mind that the length of treatment largely varies on your commitment to wearing the Inman Aligner. On average, you should be wearing them for at least 16 to 20 hours a day, which is also less than what you’ll find with a typical clear braces system. Inman’s retainer is removable, making it easy to brush and eat your favorite foods without worry of food getting stuck in your hardware. It also makes it easy to clean them, unlike traditional braces. Every two to three weeks, you’ll need to visit a cosmetic dentist in Norwood to confirm that your progress is creating your desired smile. Who is the Inman Aligner For? Want to learn more about this revolutionary device? Schedule an appointment with a dentist today to get started! Dr. John T. Michaels earned his DDS degree from the Ohio State University Dental School. Since then, he’s taken over a 1000 hours total in numerous dental topics, including cosmetic dentistry and orthodontics. To learn more about his practice, contact him through his website. Comments Off on Learn How These Clear Braces in Norwood Can Shift Your Teeth!